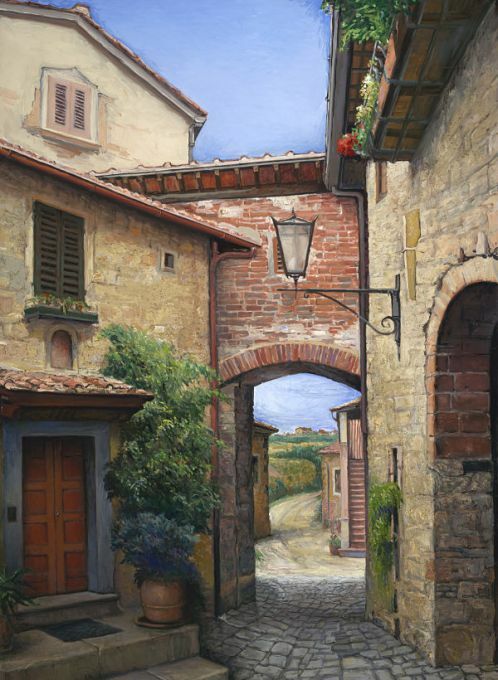 Italy - Print - Tuscan Courtyard - 60x48 gallery wrap canvas print available $2100: also 40x30 $1140. Paper print $75.Also available a framed and matted print in brown wood frame $275. Canvas prints: 60x48 canvas print available $2100. Also 40x30 $1140. Other sizes may be ordered. This is a Limited Edition Giclee/Fine Art Print of an original painting by Sergio Ladron de Guevara. It is available on CANVAS or archival PAPER, each in editions of 96, with 9 artist proofs. A Certificate of Authenticity, signed by the gallery and the artist, comes with purchase of the canvas print. Our giclees are of the highest quality. We use the finest inks, papers and canvas available. Several coats of UV varnish ensure superior protection. The varnish adds a beautiful sheen to the work. The 13x19 archival PAPER print may be easily ordered on this page. The actual IMAGE will vary in size according to proportions of the original painting, but the shortest side is always approximately 11 inches. These prints are hand-signed and numbered by Sergio himself. For a limited time the shipping and handling are free. Our gift to you to thank you for your interest in Sergio’s work. The canvas prints are stretched on 5/8 inch stretcher bars and may be purchased here in the sizes listed under each print. You may also order custom sizes to fit a specific area of your home by contacting Karen Ladron de Guevara at 480-595-1123 or galeriabellasartes@msn.com. If you would like 1.5 inch stretcher bars (known as gallery wrap – frame not needed, may be hung as is) they must be ordered through Karen. All edges are painted with a neutral color and are back stapled so even the 5/8 inch prints may be hung as is. Framing may also be arranged. 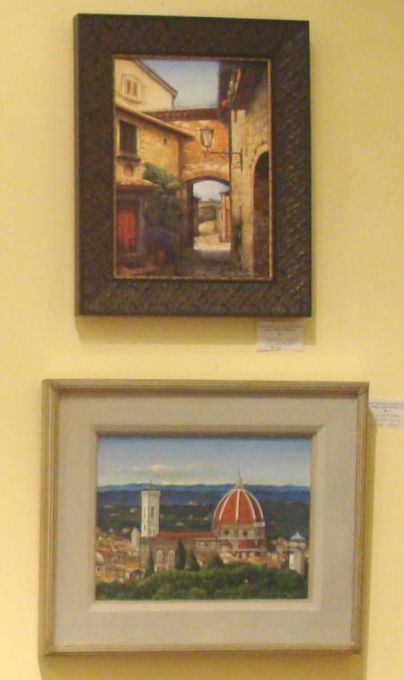 Karen has many ideas to help you find the perfect frame. Shipping, packing and insurance will be charged on these pieces. AS LONG AS YOU SEE THIS NOTE THERE WILL BE NO CHARGE FOR SHIPPING, PACKING AND INSURANCE ON PIECES PURCHASED ON LINE THROUGH PAYPAL AT REGULAR PRICES. THIS DOES NOT APPLY TO ITEMS ON SALE. Copyright © 2018 SERGIO LADRON DE GUEVARA.